It's the day before New Year's Eve when a friend and I arrive at Falls Festival Byron Bay. Unlike the other people we see, however, we haven't brought a tent, an esky, folding chairs or sleeping bags. Just an overnight bag each, because we're staying at Flash Camp, a new glamping ("glamorous camping") experience that's breathing new life into Australia's festival scene – ironically by returning to glamping's mobile, safari-based roots. It's no coincidence that one of Flash Camp's two directors is Ben Hutchings. His parents, Irena and Jeremy Hutchings, inspired by the simple luxury of their safari experiences in Africa, pioneered glamping in Australia when they opened Paperbark Camp at Jervis Bay in 1998. Now Ben is pioneering mobile glamping here, along with his business partner, Byron Bay-based hotelier and tourism guru Cameron Arnold, "borrowing" the concept of a mobile boutique hotel from the mother of all music and arts festivals, Glastonbury in south-west England, where festival-goers have been glamping for years. The big idea: to bring music-lovers who'd rather not sleep on the ground or queue for portaloos, back to festivals. "In Australia there seems to be a rejection of the festival scene once you get to a certain age or a certain point in your life, certainly in Sydney," says Hutchings. 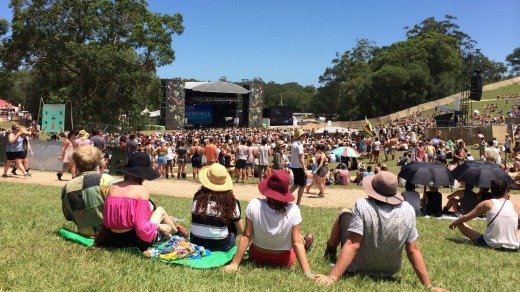 "What we want to do is create a space where coming to the Falls Festival or Splendour in the Grass or Hope Estate [in the Hunter Valley] becomes a holiday rather than hard work." Not that Flash Camp is just for mature-age Boomers. "We had a few families at Splendour, and a couple of young girls whose parents had given them the Flash Camp experience as a birthday present." 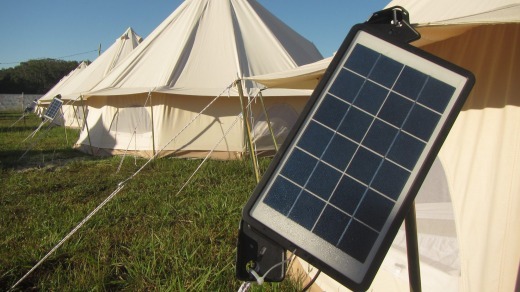 Taking its lead from Glastonbury, Flash Camp pitched 50 UK-made canvas bell tents at the first Falls Festival Byron Bay in December 2013. They were a hit, but too hot for our scorching summers. 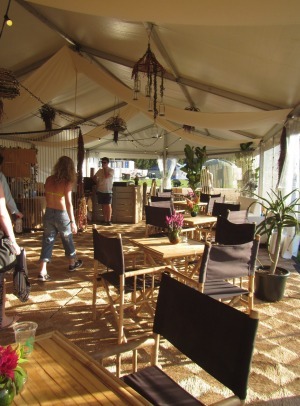 Hutchings and Arnold went back to the drawing board, emerging six months later at Flash Camp's second festival, Splendour in the Grass, also at Byron Bay, with 140 new tents custom-designed for the Australian environment. By then, a few other mobile glamping outfits had started popping up (see box), most specialising in smaller, one-off events such as weddings and weekend escapes. The new tents were made of a lightweight canvas with mosquito netting and sides you can roll up for ventilation. "We wanted them to be lighter in tone, too," says Hutchings, "so during the day there's a nice ambience inside and they're not dark spaces, as a lot of canvas tents can be." There's a touch of Out of Africa about them when we arrive and follow a porter pushing a shiny new wheelbarrow (bearing our bags) down a grassy central avenue flanked by neat, army-camp rows of the elegant, off-white tents. Each circular tent is five metres across and three metres high – big enough to accommodate up to four people on inflatable single or queen Aerobeds, which are as high as real beds so there's no need to do the "camping crouch". There's navy bed linen, two pillows each, designer cushions, a small bedside table. At night, a solar-powered light on the central pole switches on automatically to welcome you home; there's also a USB port for recharging your phone. It's more basic than regular glamping because everything has to fit on the back of a truck to get it to the next festival. Even so, Flash Camp makes you feel like a VIP from the moment you check in, which is its real point of difference from its competitors. 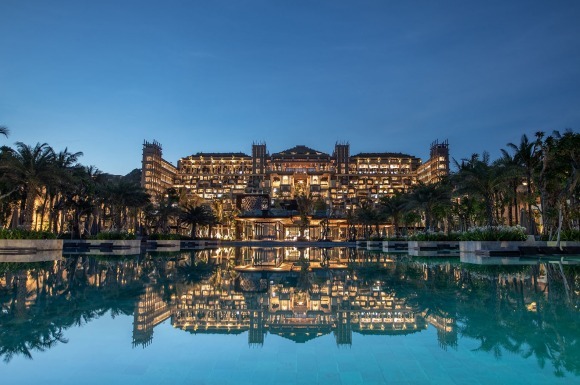 There's a hotel-like reception area (a sign at the entrance actually says "Hotel guests only") with seagrass matting, pot plants and a glass urn of chilled coriander-and-cucumber-flavoured water. There's free Wi-Fi in the adjoining licensed cafe, cane lounges, outdoor tables under canvas umbrellas and catering by Bronte-based Three Blue Ducks, soon to open a farm-based restaurant in Byron Bay (Flash Camp tries to use local providores at every location). If you've ever free-camped at a festival, or a public campground, the amenities are a dream come true. Think: fresh flowers, flushing toilets, fluffy white towels. Everything is clean. The all-white unisex shower cubicles have dispensers of eco-friendly Sukin bodywash, shampoo and conditioner. 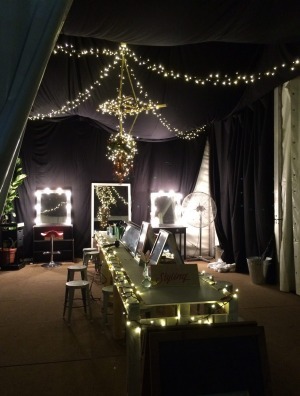 There's even a "powder room" with hairdryers and lotions, mirrors galore – and a hairdresser. The best part is that while all this is just a stroll from everything this fairground for grownups has to offer, it's also far enough from the main stages to chill out between acts and get a good night's sleep, sans earplugs. As Hutchings puts it: "Flash Camp is for anyone interested in going to larger scale events in their time off, but who doesn't really like rubbing shoulders with the many masses out there and wants a place just to relax, a little sanctuary amid all the fun. That's what it's all about." With four festivals under its belt and more planned for this year, Flash Camp is still out in front and already looking beyond festivals to events such as the Australian Motorcycle Grand Prix on Phillip Island and concerts by Rod Stewart, Sting and Paul Simon in the Hunter Valley. Watch this tent space. 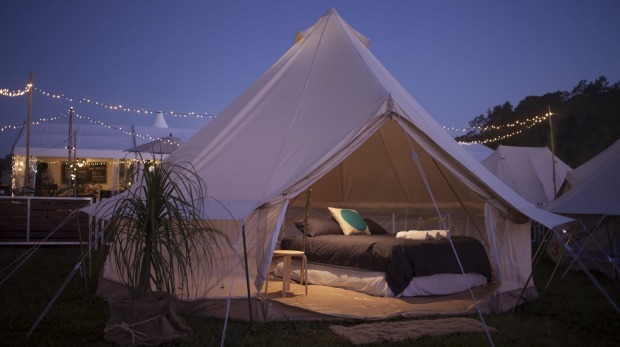 Five more ways to "glamp on the go"
Flash Camp's next event is Hope Estate's new Campfire Festival on March 13-15 in the Hunter Valley, NSW. Rates start at $1170 for two people over three nights ($195 a person per night) plus festival tickets ($199 for a three-day pass). There are also packages that include VIP festival tickets, a bottle of wine on arrival, breakfasts, picnic lunches and four-course dinners. The writer was a guest of Flash Camp.